This statistic illustrates the score of Japanese consumers on MasterCard's own Mobile Payment Readiness Index (MPRI). The index covers three varieties of mobile payments: person to person (P2P), mobile e-commerce (m-commerce), and mobile payments at the point of sale (POS), and measures the customers' willingness and readiness, as well as their actual implementation of these three payment methods. 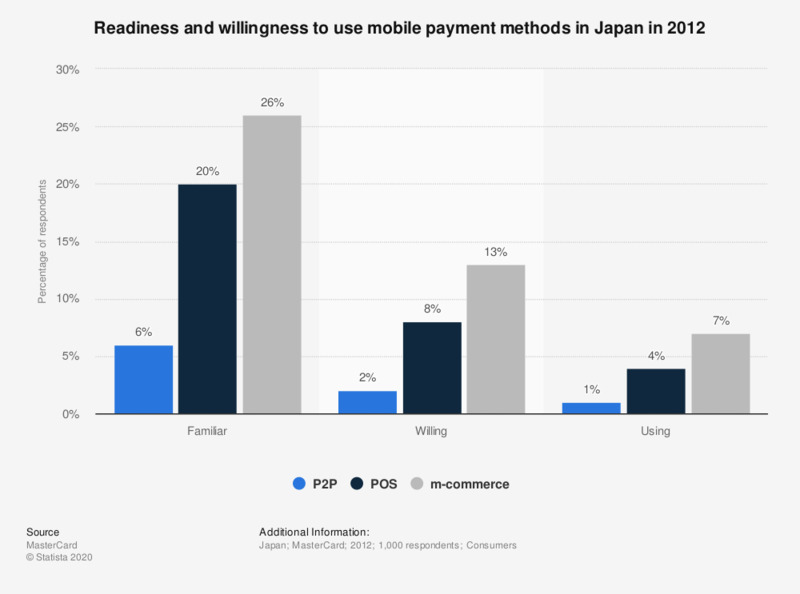 In 2012, 20 percent of Japanese consumers were familiar with mobile payments at the point of sale and 8 percent were willing to try them. The MPRI is fundamentally a data-driven index. It includes 50 variables comprising six components. MasterCard weighted each of these components, combining the results to create a unitary score on a 100-point scale for each of the 34 countries. The components are a mix of quantitative and qualitative data. Five of the components—Environment, Infrastructure, Regulation, Consumer Readiness, and Financial Services—are in large part quantitative. The remaining one—Mobile Commerce Clusters—is a more qualitative assessment of readiness. The source does not mention the age group of the respondents.